Worldwide charters available. Call for details. Purchase a business and benefit from the income and depreciation of expense as you own the ultimate dream boat by placing your vessel in day to extended rental and charter with Purcell yacht Charters. Sail and power any size will qualify. Call to discuss. 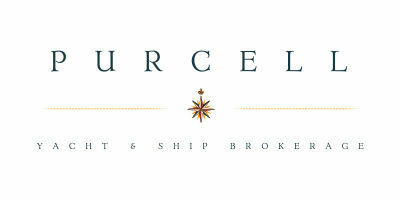 Interviewing for charter agent, work from our or your location, liberal commissions. Also, purchase a boat for your personal enjoyment, considerable income and tax benefits. Call to discuss. The 102' "Celebration" is Coast Guard certified for 300 passengers including captain and crew and will comfortably seat 200 for sit down events. 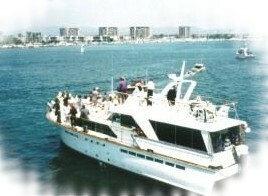 Based in Marina del Rey, she can cruise to San Diego or Santa Barbara in four hours. Call for rates. 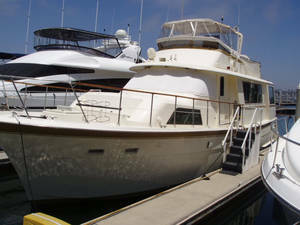 This classic 57' Chris Craft constellation is Coast Guard certified to accomodate 56 passengers including captain and crew for cocktail cruises and sit down events. Based in Marina del Rey. Call for rates. This 96' Classic Fantail Motoryacht is Coast certified for up to 100 passengers. She is capable of cruising to San Diego and Marina del Rey. Available for all occasions including parties, seminars and memorials at sea. She has a large saloon with adjoining aft deck accomodating up to 50 guest in comfort. For overnight she has sleeping for six. You can rent her by the hour and cater your party or request a package agreement which will include refreshments and entertainment. 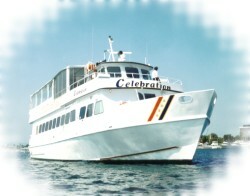 The Vessel is presented to satisfy your concept of a sucessful and fun experience to remember. 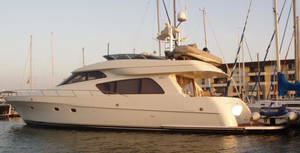 65' Mckinna versitile pilothouse motor yacht with 4 staterooms easy acces to all stations and boarding.